Research in this group is focused on understanding all protein-solution phenomena that span classic solubilization/aggregation to modern industrial application. Specifically, we aim to control the protein solution by a designed solvent with conventional additives. Proteins are prone to inactivation in aqueous solutions because chemical modification and aggregation usually occur, particularly at high temperature. This review focuses on the recent advance in practical application with amine compounds that prevent the heat-induced inactivation and aggregation of proteins. Coexistence of amine solutes, typically diamines, polyamines, amino acid esters, and amidated amino acids decreases the heat-induced inactivation rate of proteins by one order of magnitude compared with that in the absence of additives under low concentrations of proteins at physiological pH. The amine compounds mainly suppress chemical modification, typically the β-elimination of disulfide bond and deamidation of asparagine side chain, thereby preventing heat-induced inactivation of proteins. Polyamines do not improve the refolding yield of proteins, owing to decrease in the solubility of unfolded proteins. 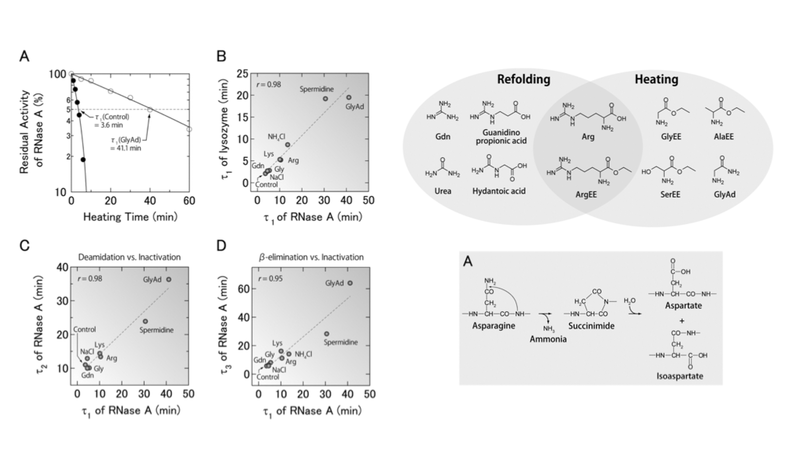 In contrast, arginine is the most versatile additive for various situations, such as refolding of recombinant proteins, solubilized water-insoluble compounds, and prevention of nonspecific binding to solid surfaces; however, it is not always effective for preventing heat-induced aggregation. Amine compounds will be a key to prevent protein inactivation in solution additives. Viscosity of protein solution is one of the most troublesome issues for the high-concentration formulation of protein drugs. In this review, we summarize the practical methods that suppress the viscosity of protein solution using small molecular additives. The small amount of salts decreases the viscosity that results from electrostatic repulsion and attraction. The chaotrope suppresses the hydrophobic attraction and cluster formation, which can lower the solution viscosity. Arginine hydrochloride (ArgHCl) also suppresses the solution viscosity due to the hydrophobic and aromatic interactions between protein molecules. 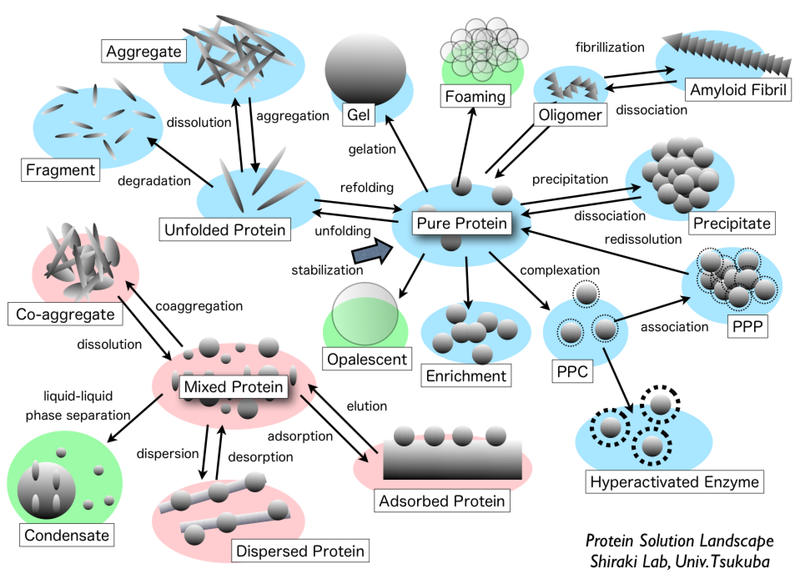 The small molecular additives are the simplest resolution of the high viscosity of protein solution as well as understanding of the primary cause in complex phenomena of protein interactions. A polyelectrolyte is a polymer composed of repeating units of an electrolyte group that enables reversible complex formation with proteins in aqueous solutions. This review introduces "wrap-and-strip" technology of protein-polyelectrolyte complex (PPC) by noncovalent interaction. Storage: protein is stabilized against physical and chemical stresses. Enrichment: precipitation through PPC can be used as an enrichment method without irreversible unfolding. Catalytic activity switch: a complementary charged pair of polyelectrolytes functions as a reversible enzyme activity switch. Hyperactivation: a specific combination of a polyelectrolyte and substrate enhances enzyme activity by one order of magnitude compared with an enzyme alone. Stabilization: PPC increases protein stability against chemical and physical stresses, such as covalently modified polyethylene glycosylated protein. Simple PPC-based technology can expand the applicable fields of soluble proteins in aqueous solutions. Aggregative protein-polyelectrolyte complex (PPC) has been proposed as a concentrated state of protein with a great potential for biopharmaceutical application. In this review article, we introduce a unique concentration method of protein formulation using PPC for a dozen types of pharmaceutical antibodies, hormones, and enzymes. Aggregative PPC can be obtained only by mixing poly(amino acid)s with proteins under low salt concentration conditions at an ambient temperature. The aggregative PPC is in a stabilized state against shaking, heating, and oxidation. More importantly, the aggregative PPC can be fully redissolved by the addition of physiological saline without denaturation and activity loss for many proteins. In addition, the general toxicity and pharmacokinetic profiles of the aggregative PPC are identical to those of the control antibody formulation. Thus, the protein formulation produced by aggregative PPC would be applicable for biomedical use as a kind of concentrated-state protein. Kazuki Iwashita, Masahiro Mimura, Kentaro Shiraki. Control of aggregation, co-aggregation, and liquid droplet of proteins by small additives. Curr. Pharm. Biotechnol. Shunsuke Tomita and Kentaro Shiraki. Why do solution additives suppress the heat-induced inactivation of proteins? Biotechnol. Prog., 27, 855-862 (2011). Yoshihiro Fujiwara, Yasuhiko Aiki, Lijun Yang, Fumio Takaiwa, Akemi Kosaka, Noriko M. Tsuji, Kentaro Shiraki, and Kenji Sekikawa. Extraction and purification of human interleukin-10 from transgenic rice seeds. Protein Expression and Purification, 72, 125-130 (2010). Under graduate students are able to join this lab from all majors (as well as Applied Physics) at College of Engineering Science, University of Tsukuba. Graduate students can apply through programs at Graduate School of Pure and Applied Sciences, Univ Tsukuba. 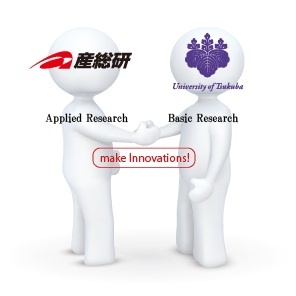 The group has links to many academic and industrial scientists, including AIST, RIKEN, Ajinomoto, Terumo, Milbon, Maruha Nichiro, Alliance Protein Lab, and many Universities. More information about current member and alumni. 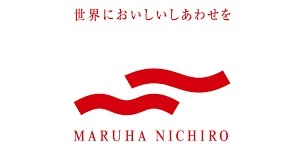 You can see more information about the theme, people, and principal investigator, in Japanese. 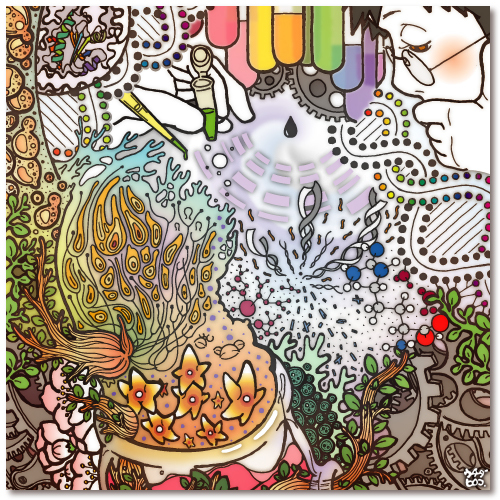 The following illustration was designed by Ms. Hiroko Uchida, a prominent scientific illustrator. Her works have been beloved by many scientists, including Nobel laureates, Prof. Yoshinori Ohsumi and Prof. Osamu Shimomura.